UK Foreign Secretary William Hague has been criticised by Venezuelan officials for suggesting Libyan leader Colonel Gaddafi was en route to their country. Venezuelan Foreign Minister Nicolas Maduro said he had spoken to his Libyan counterpart, who had assured him Col Gaddafi remained in Libya. 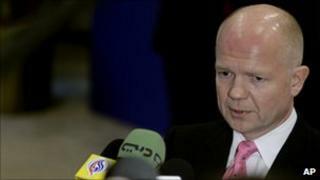 He called Mr Hague's comments "irresponsible". Later Col Gaddafi appeared on Libyan TV and denied "malicious rumours" by "hating channels" about him leaving. Outside a ruined building, he said: "I am in Tripoli and not in Venezuela." Mr Hague, who made his comments at a meeting of EU foreign ministers on Monday, said he had seen unconfirmed information suggesting Col Gaddafi was heading to Venezuela. But Mr Maduro said his Libyan counterpart, Moussa Koussa, had spoken to him via telephone from Tripoli and told him Col Gaddafi was "dealing with the situation confronting the country". Mr Maduro said he hoped the Libyan people would find "a way of solving its problems peacefully without the interference of imperialist states whose interests in the region had been affected". He also referred to the "historic friendship" between Libya and Venezuela, who are both members of Opec. Venezuelan President Hugo Chavez has visited Libya half a dozen times during his 12 years in office. In 2009, Col Gaddafi visited Venezuela and presented President Chavez with one of the large tents he uses during his foreign travels.